Pyjamarama follows a fairly basic premise: either two or three acts perform sets in front of a studio audience and Arthur Smith, in a series of wonderfully 80s jackets (although he strips half naked in one episode), acts as the compere. Appearing throughout the series are acts as diverse as the lugubrious Norman Lovett, masters of physical comedy The Joeys, the mimicry of Chris Barrie and there’s even time for John Hegley and The Popticians. 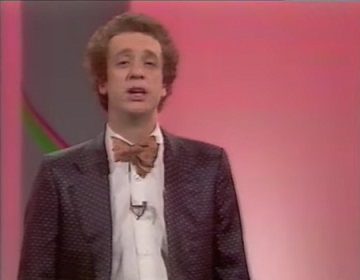 Having previously only produced arts programmes in the shape of The South Bank Show and Book Four, LWT were determined to venture further into the arts in the mid-1980s. Alongside new series such as The Arts Review of the Year and Hey Good Looking! there was also time to explore the vibrant comedy landscape of the day in the form of Pyjamarama. Shown only in the LWT region, Pyjamarama was a six episode series which was transmitted at 11.30pm on Fridays on ITV. Episodes were typically 25 minutes long, but the final episode was extended to 40 minutes. The series was the brainchild of LWT researcher Mark Holloway while Melvyn Bragg acted as executive producer. Arthur Smith came on board the series, as he recounts in his wonderful memoir My Name is Daphne Fairfax, following an approach by LWT while he was performing in Edinburgh. Compared to the glitzy stage sets and palatial seating areas of modern stand-up shows, Pyjamarama is a rather cramped affair. It takes place against a pink lighted backdrop, punctuated only by some unremarkable columns with occasional neon flourishes of pink and green. 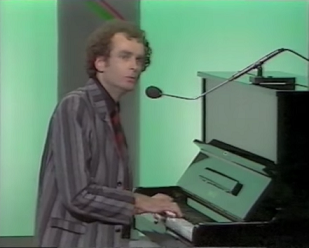 Thankfully, the main action is taking place centre stage and it all starts with Arthur Smith. 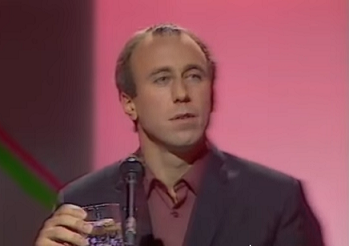 Whether he’s ripping his top off to perform some agit-poetry in the style of a dyslexic Channel 4 poet or merely introducing John Dowie as “a dull, dour, mean spirited American toilet”, Arthur Smith is already showing his brand of unpredictable, observational comedy all fed through a South London filter. And, yes, he wears some fantastically 80s suits with my favourite being a beige affair with grey flecks. We’re not here, however, to discuss Smith’s sartorial elegance. 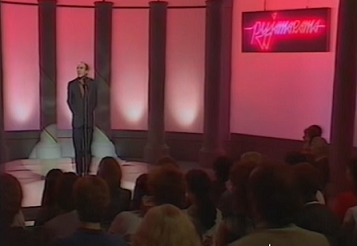 Instead, Pyjamarama, with its vaguely unreadable logo, wants to demonstrate the thriving and varied stand-up scene of 1984. Whereas modern stand-up concentrates, with the occasional exception, on solo performers, the 1980s was a time of great variety taking in sketch troupes, musicians and poets. And with people of all backgrounds stumbling into the scene, it ensured a whole host of influences were stoking the engine. You only have to a take a look at the lineups to understand the choice on offer. The Joeys’ fantastic mime/physical comedy takes in deep space madness and ‘emotional boxing’ sketches while Ronnie Golden plays out songs which poke fun at his similarity to Buddy Holly and Elvis Costello. Alternatively, how about the magisterial impressions of Chris Barrie rubbing shoulders with satirical singing group Fascinating Aida? Yes, that happened. And that’s before we mention early TV appearances by Mark Steel and Clive Anderson. Crucially, Pyjamarama presents comedians that are more than capable of producing laughs from the viewing public. Sure, the atmosphere of a comedy venue – all dark, grimy and full of cut price lager – is difficult to reproduce, but the quality of the material on offer in Pyjamarama ensures that the laughter can’t help but snort out of your nose. And, okay, comedy is subjective, but there really is something to tickle everyone here be it through poetry, song, sketch or just good old fashioned story telling. Stand-up comedy on television may have become slicker in the intervening decades since the mid-1980s, but this increase in production values does nothing to reduce the lustre of those early days. Presenting a considerably less homogenised landscape than its comedy descendants, Pyjamarama is not just funny, it should also be seen as an important step in developing stand-up comedy on television. And, for that final reason alone, its curiosity value is assured.